In 2016 outline planning permission was granted for the development of new homes on land east of Vicars Hall Lane in Boothstown Salford. Peel has sold the land to Bellway who are delivering 107 homes on the land. The outline planning application included for a package of improvement works to existing green recreational routes and to Vicars Hall Lane Village Green, Bridgewater Nature Park and the Bridgewater Canal to benefit the local community. 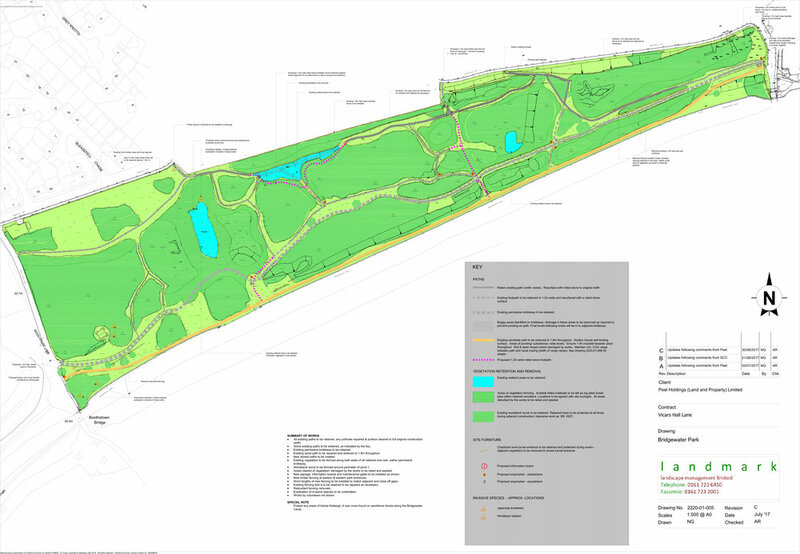 As well as recreational improvements the planning permission required the creation of a new ecological area on Vicars Hall Lane at Stirrup Field. Peel will over the next two years be implementing these improvements. Landscape contractors Landmark Landscape Management Limited will be undertaking the works on behalf of Peel. The improvement works will enhance existing green infrastructure to create a series of attractive, well maintained, wildlife friendly spaces and recreational routes. 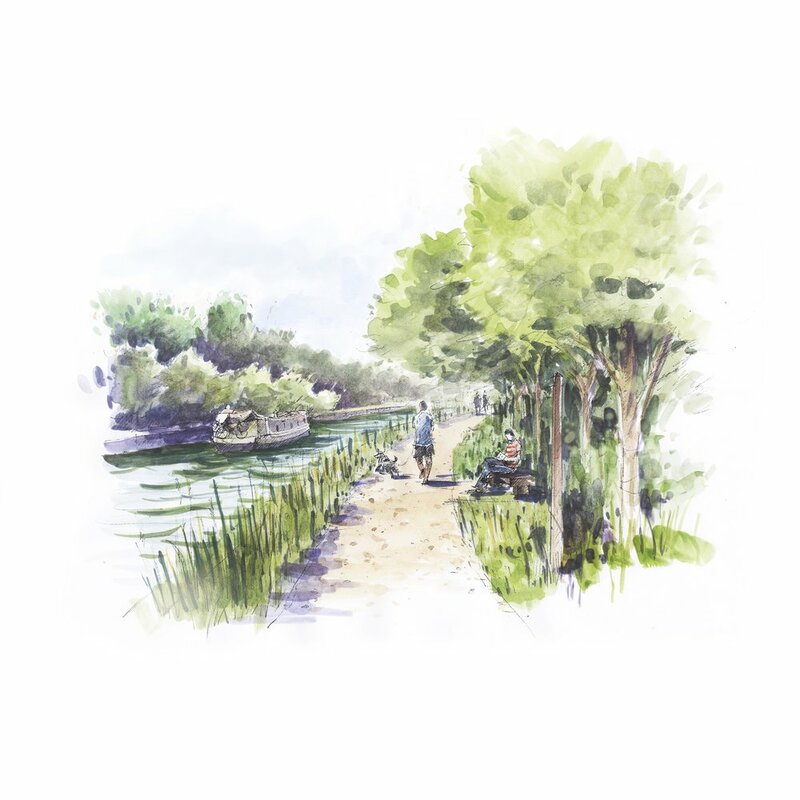 The principle of the scheme is to enhance existing recreational provision which is used by the local community and the key connections between these recreational spaces. The improvements will enable and encourage circular walks to be undertaken by the local community in Boothstown. The improvements will help in creating pleasant routes for recreation and exercise to promote health and wellbeing, while also increasing biodiversity. The locations of the proposals are identified on the Recreational Improvements Overview Plan. The improvement works include the section of footpath west of Moss House Lane bridge to the Salford and Wigan Local Authority boundary which is located 300 metres west of Vicars Hall bridge. The existing footpath has an attractive setting it is informal and winding and has the character of a woodland or country path in parts. The proposed improvements are set to build on and retain this existing character. The current condition of the path will be improved the existing path is uneven in parts and can become muddy especially during periods of wet weather. 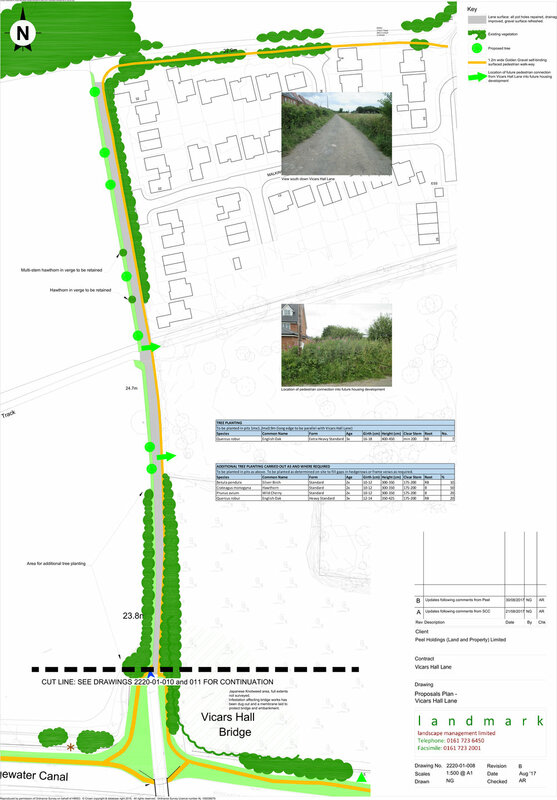 The propsoals include resufacing of the existing path, to create an even footpath surface. The path widens west of Vicars Hall Bridge and provides an opportunity to provide more seating areas and infomal play equipment for the local community to use. To direct footpath users towards other recreational areas in the locality two waymarkers will be installed one near Vicars Hall Bridge to direct to Bridgewater Nature Park and to the Bridgewater Way. The second waymarker will be placed a Moss House Bridge to direct to the Village Green and to Vicars Hall Lane. These works started in December 2017 and are expected to be completed in the spring of 2018. During this time the permissive footpath could be closed along the northern bank of the Bridgewater Canal. The towpath on the southern bank, the Bridgewater Way will remain open. The Bridgewater Nature Park is an existing well used nature park with a series of footpaths running through the park. There are areas of the existing park however where vegetation has become overgrown and is encroaching on the footpaths and existing ponds. This vegetation will be managed as part of the works to open up footpath and to improve biodiversity around the ponds. The existing boardwalk located in the park is coming to the end of its useful life. This boardwalk will be removed and a new path created around the edge of the pond. New information boards will be installed which will include content on heritage features, found within or close to the park including information on the Chaddock Tunnel and the Bridgewater Canal. Other interpretation boards will include information on the habitats and species found in the nature park. Existing benches will be replaced with new seating areas. These works will commence in January 2018 and are due to be completed March 2018. The works will be completed in phases during this period. Some of the areas of the park may not be accessible while the works are completed. The proposal will refresh the Village Green with new planting, seating and footpath improvements. The new planting has been selected to provide colour through much of the year whilst being tough and low maintenance and includes trees to east and west set in low evergreen groundcover to improve the sense of openness. It is scheduled that these works will be undertaken in January and February 2018. Moss House Lane Corridor runs from Vicars Hall Lane to the Moss House Lane Bridge. The corridor provides a green route separate from road traffic for pedestrians and cyclists. There is no general right of vehicular access by the public formal right of vehicle access is limited to a local farmer. The lane is boarded by hedges and trees on both sides. The hedges form the back boundaries of private gardens. The proposals will include improvements to the existing surfacing and the vegetation will be managed to improve the user experience. It is expected that these works will be undertaken in April / May 2018. The lane is popular with walkers however there is no formal footpath along the unadopted section of the lane. 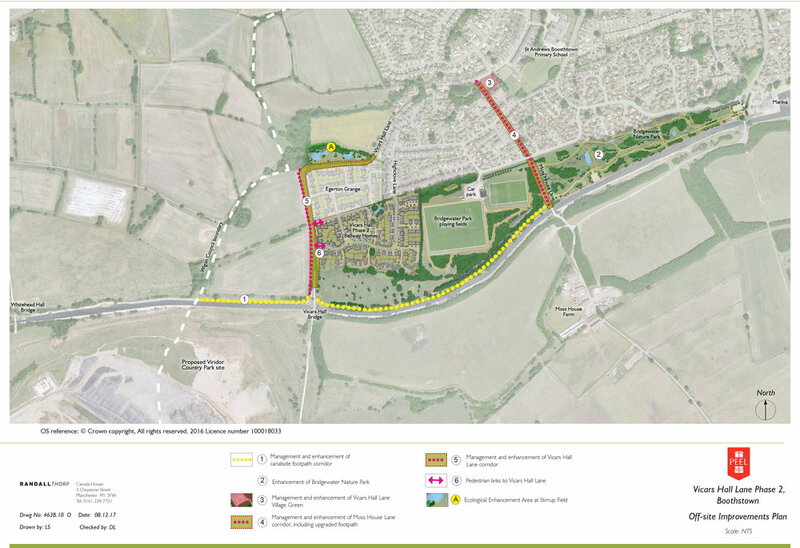 The proposals include for a deisgnated pedestiran footpath along the lane which will start near the recently built Egerton Grange development close to Stirrup Field Ecology Area. Connections from the existing residential area onto Vicars Hall Lane are proposed. These connections will enable convenient connections for the local residents onto the green infastructure routes in the area. The works will be completed in phases over the next two years. The phasing is to ensure the works are undertaken outside important seasons for ecology and habitats. While the works are on-going areas may need to be closed off from the public for safety reasons. Notices will the erected around the areas of work to notify of any closures and when the areas will be reopened. As well as the recreational works a new ecological area has recently been completed by Landmark on behalf of Peel. The ecology area includes the creation of marshy grasslands habitat, two seasonal ponds, habitat piles, bat roosting and bird nesting opportunities. The area has been created to mitigate for the loss of marshy grassland and ponds on the housing development site. The translocation of the marshy grassland and orchids from the development site was undertaken in the summer of 2017. This ecology area has an annual maintenance and monitoring programme to ensure the habitats establish on the site over the next 5 to 10 years. The ecological area is identified on the Recreational Improvements Overview Plan. The ecology area can be seen from Vicars Hall Lane. To ensure the habitats in the ecology area develops and thrive public access is not permitted into the ecology area.